All applicable foreign wars and campaigns. An unaltered photocopy of your DD-214 or DD-214 and DD-215 (post WW2), OR unaltered photocopy of WD AGO 53-55 (WW2), or other military issued document clearly displaying your award of the Bronze Star Medal. (2) While engaged in military operations involving conflict with an opposing foreign force. c. When the Bronze Star is awarded for heroism, a bronze letter "V" (for valor) is worn on the suspension and service ribbon of that medal. Source: The provisions of Executive Order 11046 of Aug. 24, 1962, appear at 27 FR 8575, 3 CFR, 1959-1963 Comp., p. 630, unless otherwise noted. 2. The Bronze Star Medal and appurtenances thereto shall be of appropriate design approved by the Secretary of Defense, and shall be awarded under such regulations as the Secretary concerned may prescribe. Such regulations shall, so far as practicable, be uniform, and those of the military departments shall be subject to the approval of the Secretary of Defense. 3. No more than one Bronze Star Medal shall be awarded to any one person, but for each succeeding heroic or meritorious achievement or service justifying such an award a suitable device may be awarded to be worn with the medal as prescribed by appropriate regulations. 4. The Bronze Star Medal or device may be awarded posthumously and, when so awarded, may be presented to such representative of the deceased as may be deemed appropriate by the Secretary of the department concerned. 5. This order shall supersede Executive Order No. 9419 of February 4, 1944, entitled "Bronze Star Medal". However, existing regulations prescribed under that order shall, so far as they are not inconsistent with this order, remain in effect until modified or revoked by regulations prescribed under this order by the Secretary of the department concerned. a. The Bronze Star Medal was established by Executive Order 9419, 4 February 1944 (superseded by Executive Order 11046, 24 August 1962).
. The Bronze Star Medal is awarded to any person who, while serving in any capacity in or with the Army of the United States after 6 December 1941, distinguished himself or herself by heroic or meritorious achievement or service, not involving participation in aerial flight, in connection with military operations against an armed enemy; or while engaged in military operations involving conflict with an opposing armed force in which the United States is not a belligerent party. c. Awards may be made for acts of heroism, performed under circumstances described above, which are of lesser degree than required for the award of the Silver Star. (1) Awards may be made to recognize single acts of merit or meritorious service. The lesser degree than that required for the award of the Legion of Merit must nevertheless have been meritorious and accomplished with distinction. (2) Award may be made by letter application to Commander, ARPERCEN, ATTN: DARP-VSE-A, 9700 Page Boulevard, St. Louis, MO 63132-5200 (enclosing documentary evidence, if possible), to each member of the Armed Forces of the United States who after 6 December 1941, has been cited in orders or awarded a recognition for exemplary conduct in ground combat against an armed enemy between 7 December 1941 and 2 September 1945, inclusive, or whose meritorious achievement has been other wise confirmed by documents executed prior to 1 July 1947. For this purpose, an award of the Combat Infantryman Badge or Combat Medical Badge is considered as a citation in orders (to active-duty personnel only). Documents executed since 4 August 1944 in connection with recommendations for the award of decorations of higher degree than the Bronze Star Medal will not be used as the basis for an award under this paragraph. (3) Upon letter application, award of the Bronze Star Medal may be made to eligible soldiers who participated in the Philippine Islands Campaign between 7 December 1941 to 10 May 1942. Performance of duty must have been on the island of Luzon or the Harbor Defenses in Corregidor and Bataan. Only soldiers who were awarded the Distinguished Unit Citation (Presidential Unit Citation) may be awarded this decoration. Letter application should be sent to the Commander, ARPERCEN, ATTN: DARP-VSE-A, 9700 Page Boulevard, St. Louis, MO 63132-5200. Description: A bronze star 1 inches in circumscribing diameter. In the center thereof is a 3/16-inch diameter superimposed bronze star, the center line of all rays of both stars coinciding. The reverse has the inscription "HEROIC OR MERITORIOUS ACHIEVEMENT" and a space for the name of the recipient to be engraved. The star is suspended from the ribbon by a rectangular shaped metal loop with the corners rounded. V Device: The bronze "V" identifies the award as resulting from an act of combat heroism or "VALOR", thus distinguishing it from meritorious achievement awards. Bronze Oak Leaf Cluster Device: (Army/AF) A Bronze OLC is worn for subsequent awards. 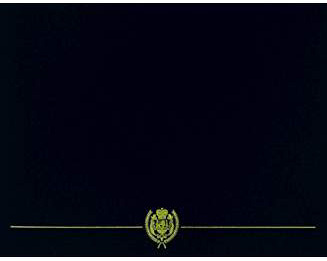 Gold Star Device: (Navy/USMC/CG) A Gold Star is worn for each subsequent award. Silver Star Device: (Army/AF) A Silver Oak Leaf is worn in lieu of 5 Bronze. Silver Star Device: (Navy/USMC/CG) A Silver Star is worn in lieu of 5 Gold. a. Decoration (regular size): MIL-D-3943/22. NSN for decoration set is 8455-00-269-5749. NSN for display medal is 8455-00-246-3829.
b. Decoration (miniature size): MIL-D-3943/22. NSN 8455-00-996-5004.
c. Ribbon: MIL-R-11589/18. NSN 8455-00-252-9915.
d. Lapel Button: MIL-R-11484/16. NSN 8455-00-265-4889. 5. Background: a. General George C. Marshall, in a memorandum to President Roosevelt dated February 3, 1944, wrote: "The fact that the ground troops, Infantry in particular, lead miserable lives of extreme discomfort and are the ones who must close in personal combat with the enemy, makes the maintenance of their morale of great importance. The award of the Air Medal have had an adverse reaction on the ground troops, particularly the Infantry Riflemen who are now suffering the heaviest losses, air or ground, in the Army, and enduring the greatest hardships." The Air Medal had been adopted two years earlier to raise airmen's morale. b. President Roosevelt authorized the Bronze Star Medal by Executive Order 9419 dated 4 February 1944, retroactive to 7 December 1941. This authorization was announced in War Department Bulletin No. 3, dated 10 February 1944. The Executive Order was amended by President Kennedy, per Executive Order 11046 dated 24 August 1962, to expand the authorization to include those serving with friendly forces. c. As a result of a study conducted in 1947, the policy was implemented that authorized the retroactive award of the Bronze Star Medal to soldiers who had received the Combat Infantryman Badge or the Combat Medical Badge during World War II. The basis for doing this was that the badges were awarded only to soldiers who had borne the hardships which resulted in General Marshall's support of the Bronze Star Medal. Both badges required a recommendation by the commander and a citation in orders (applicable to active-duty personnel only. For veterans (discharged personnel) the award is retro-active without citation in orders. A DD-215 issue is not required. See notation of "CIB" or "Combat Inf'ymans Badge" on WD AGO 53-55 for automatic authorization of the BSM). d. Order of precedence and wear of decorations is contained in Army Regulation 670-1. Policy for awards, approving authority, supply, and issue of decorations is contained in AR 600-8-22. 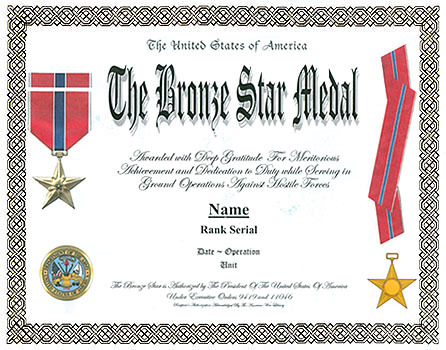 There is hereby established the Bronze Star Medal, with accompanying ribbons and appurtenances, for award to any person who, while serving in any capacity in or with the Army, Navy, Marine Corps, or Coast Guard of the United States on or after December 7, 1941, distinguishes, or distinguished, himself by heroic or meritorious achievement or service, not involving participation in aerial flight, in connection with military or naval operations against an enemy of the United States. The Bronze Star Medal and appurtenances thereto shall be of appropriate design approved by the Secretary of War and the Secretary of the Navy, and may be awarded by the Secretary of War, or the Secretary of the Navy, or by such commanding officers of the Army, Navy, Marine Corps, or Coast Guard as the said Secretaries may respectively designate. Awards shall be made under such regulations as the said Secretaries shall severally prescribe, and such regulations shall, so far as practicable, be of uniform application. No more than one Bronze Star Medal shall be awarded to any one person, but for each succeeding heroic or meritorious achievement or service justifying such an award a suitable device may bc awarded to be worn with the medal as prescribed by appropriate regulations. The Bronze Star Medal or device may be awarded posthumously and, when so awarded, may be presented to such representative of the deceased as may be designated in the award. FRANKLIN D. ROOSEVELT THE WHITE HOUSE, February 4, 1944 1495 F. R. Doc. 44-1762; Filed, February 5, 1944; 10:15 a.m.